Situated on the west coast, ten miles (16km) from the airport and the capital Ibiza, San Antonio is the largest and liveliest holiday resort on the island. Known as 'San An' to the thousands of British clubbers who descend here each summer, the resort's proper name is Sant Antoni de Portmany. San Antonio's wide bay is lined with bars, restaurants and apartment blocks catering mainly for young British and European holidaymakers. There are a few small sandy beaches in the resort, and the spectacular beaches of Cala Conta, Cala Bassa and Cala Tarida are a short ferry ride away. 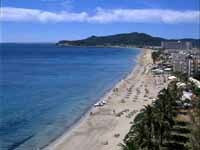 The beaches of San Antonio are ideal for swimming, with shallow and safe water. July and August are the best months to visit for those looking to experience the buzzing nightlife in San An - arguably the best party resort on the best party island in Spain - while the months of May and June, and September and October are most popular with families, couples and older visitors who prefer to avoid the fashionable hubbub of the peak summer months. There is a selection of shops in and around San Antonio catering for holidaymakers, from the inevitable bucket and spade stores to designer boutiques. Good buys include the local porcelain and leather goods. The local supermarkets are great and stock all the well-known brands (particularly British brands); alcohol and cigarettes are particularly cheap. Ibiza Town is the best place to find the latest fashion accessories; the shops don't close until well after midnight during the high season and in the evenings the port area takes on the ambience of a hippy market with street vendors and stalls selling everything from jewellery to cheap CDs. The resort has a huge variety of restaurants and fast food joints. San Antonio has three areas: 'The West End', which is packed with lots of small bars, fast food restaurants and pavement cafés; the more upmarket 'Sunset Strip', where the better restaurants are found; and 'The Bay', which has an eclectic mix of bars, restaurants, clubs and hotels. Some restaurants offer good local Spanish fare and excellent locally-caught seafood but the majority cater for more British tastes with international staples like hamburgers and chips, full English breakfasts and Sunday roasts. Chinese, Indian and Italian food is also readily available. San An is a joy for party animals! Cafe Del Mar is San Antonio's most celebrated social venue and a must for all visitors and holidaymakers looking for a good night out. Ibiza is synonymous with clubbing and the nightclubs in and around San Antonio attracts the best DJs from around the world. A great place to start off the evening is in one of the bars along the Sunset Strip. Privilege is said to be the world's largest club, located on the long straight road to the Ibiza Town. The safe, shallow waters of San Antonia bay are great for swimming and holidaymakers can find some of the best beaches only 20 minutes away by public transport or ferry. Water sports and scuba diving can be organised at the seafront and on land everything from golf and tennis to quad biking, go-karting and horse riding can be arranged, making Ibiza a great destination for sports enthusiasts. The interior of the island and much of the coastline is surprisingly unspoilt and can be easily explored, and Ibiza's historic Old Town is well worth a visit for a bit of culture. San Antonio's beaches aren't great, but the spectacular beaches of Cala Conta, Cala Bassa and Cala Tarida are easy to get to. The West End is very noisy and at night is packed with sales reps and 'looky-looky' men trying to sell watches, jewellery, sun glasses and drugs. Those looking for a less hectic evening should stick to the San Antonio Bay end of town. The big clubs can be expensive.